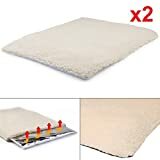 Art of Paws Electric Heated Pet Bed; Warm Wooly Heated Pet Mat; Superior Quality Electric Heated Cat Bed and Ideal Heated Dog Pad; 100% Money Back Satisfaction Guaranteed! Our dogs deserve the utmost comfort and warmth, whether it be when they lie down for a rest or bed down for a snooze. There is simply no better solution than a heated dog bed! In a variety of shapes, colours, sizes and style, there is a heated dog bed out there for every pooch. 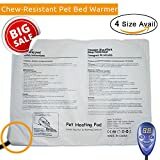 Why buy a heated dog bed? Well firstly they are lovely and warm, making for a great place to curl up on those cold nights. During winter they can be the perfect source of heat for your dog if the house gets cold. Because heated dog beds provide your dog with warmth, they are just great for soothing muscle and joint aches. Dogs that suffer from muscle aches, joint pains or arthritis will find great relief and comfort from a heated dog bed. Young or small dogs are more prone to feeling the cold. A heated dog bed also simulates the warmth that a small dog or puppy would feel if they are part of their pack or litter. Psychologically this can be very comforting! Heated dogs beds are far from just a luxury. They provide comfort and health benefits. How do they warm up? 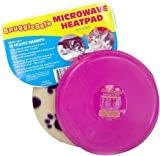 Most heated dog beds will have a heat pad inside them which you will plug into mains electricity. Heated dog bed are very energy efficient so are relatively cheap to run - so no massive bills for pooch to pay! The heating pads normally have an internal thermostat so they can stay at the perfect temperature all of the time. Many heated dog beds can have the heating pad removed so that the bed can be machine washed - clever! 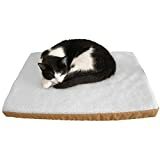 Most of the normal considerations on choosing a normal dog bed also apply to choosing a heated dog bed. Remember to choose the right size, preferred colour and so on. Since heated dog beds are plugged into the mains, the attached cables will be of varying lengths. You will either need to place the heated dog bed close to a plug socket or buy an extension lead. Heated dog beds aren't just a luxury, they provide comfort, relief and well being for dogs. If your dog sleeps in a cold area at night, they are a great gift. Equally, if your dog suffers from muscle or joint aches, a heated dog bed will prove incredibly popular. Get tough with indestructible dog beds!